Welcome to the historic port of Dartmouth. It’s unique setting on the beautiful River Dart as it reaches the sea has made this a water lovers paradise. This Medieval town bustling with small shops and restaurants makes a great cottage holiday destination. Imagine…a steep, wooded hillside dropping down to a river that opens out into the sea. Narrow, ancient roads meander through the town where pirates and seafarers once walked with tradesmen and Royalty. Georgian villas, fishermen’s cottages, timber-frame structures, old stone churches, fort, castle and the Britannia Royal Navel Collage dot the towns landscape, as jumbles of flowers grow from the walls and overhang in baskets and terracotta pots through the narrow streets. 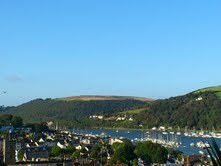 As you arrive into Dartmouth you will be greeted by the gorgeous River Dart and the sent of sea air. Small fishing and sailing boats sail past luxury yachts and cruise ships that are tendered for the night. 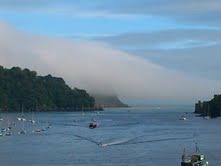 The old steam train crosses through your view to Kingswear puffing out steam as it passes, singing it’s nostalgic tune. Palm trees line the waterfront and everywhere you tread you are following in the footsteps of history. The ‘mouth of the Dart’ has been mentioned in the Anglo-Saxon chronicle in 1049 as a ‘haven and landing place’ and is mentioned in the Domesday Book in 1089. It was the port of the 2nd and 3rd crusades and later the Pilgrim Fathers stopped here for repairs before going onto Plymouth and then to America. Dartmouth was also the base of Sir Walter Raleigh and Sir Francis Drake. In 1944 there were 480 Allied ships that left out of Dartmouth for the D-Day invasion. 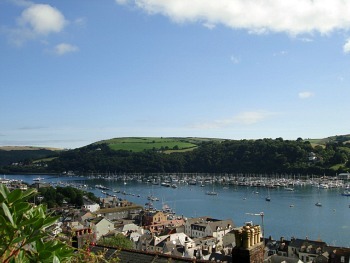 This is the historic port of Dartmouth and it will welcome you with open arms and a mischievous wink. Whatever your pleasure you can find it here as there is something for everyone; from organic local food, celebrity restaurants, adventures on the river, murder mystery weeks, steam trains, Navel history, tales of swash buckling pirates, art galleries, shopping, fishing and marine life, festivals, walks along the south west coast path or just simply hanging out with the towns friendly locals in the pub. Dartmouth is the type of place that will get under your skin if you let it. 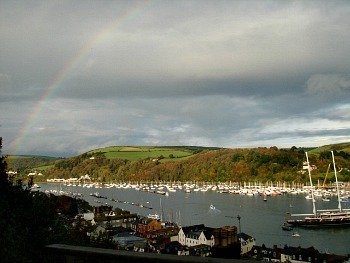 I spent a year living in Dartmouth in a little cottage with a view of the River Dart. It was a delightful place to live and I highly recommend a visit to this Medieval town that has been enjoyed by Sir Francis Drake, Sir Walter Raleigh and the Queen herself. 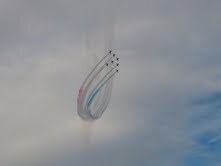 These were some of the highlights of my year. The South West goes all out for foodies in the month of September. In every county and town there is some kind of food festival and Dartmouth is no exception. Food and beverage tents line the embankment and the old cobbled Market square and you can savour everything from fried mackerel bap’s to hog roasts and fresh oysters. There is plenty to buy and take home such as local country wines, jams, venison, fresh seafood, cakes, smoked garlic, cheeses, and more. The celebration of South West food begins in the Seahorse restaurant on the embankment in the afternoon make reservations early if you want to go. Local restaurants and pubs will have there own foodie events you can find brochures around town with a list of ‘what’s on’. If you need to brush up your skills, cooking demonstrations are on throughout the event. Each year is full of festivities in May the brilliant Music Festival takes over Dartmouth with bands from all over the world playing everything from Bluegrass to Spanish acoustic guitar, they are nestled into locations all around the town from Bayard’s Fort to the Church to local pubs. A spectacle not to be missed by the music lover which has been described as “the best small music festival in England” I whole heartedly agree. The big event on Dartmouth’s calendar is the Regatta. The small town of approximately 5,400 is jam packed with an estimated 18,000 visitors arriving daily for the four day Regatta! There are over 2,000 people competing in 12 varied sporting events including sailing, rowing, whaler rowing, swimming, running, bowls, tennis and the waterborne tug of war. The town is adorned with bunting and flowers, the air is abundant with excitement and anticipation of the main event of the year. Local shops compete in the window dressing competition and the shopping village opens and social season goes up a notch with the Regatta ball, Regatta Rock and opening day festivities. 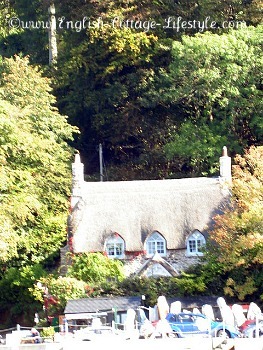 The River Dart comes alive with boats of all kinds many with decorations and sailors in costume. 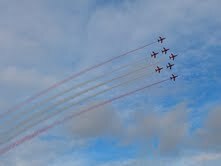 Bands play in the pubs and if that was not enough, there are air displays from helicopters and the Red Arrows and two nights of fireworks. 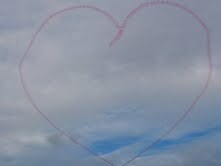 The whole event is put together by a team of dedicated volunteers and funded by local sponsors and donations. 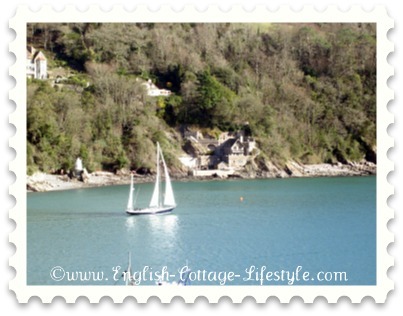 Dartmouth maybe a Mecca for sailor’s and water lovers but there is also plenty for the cottage lover to enjoy. The entire town is full of small cottages lining the streets and stairs with jumbles of flowers spilling over pots. Old buildings, historic pubs and tea rooms abound and you will be spoilt for choice when it comes to eating out. The restaurants that I love are: Rock Fish (oysters, fish and seafood), Taylor’s (varied and great vegetarian) Seahorse (celebrity), Jan and Freddie’s Brasserie and the French Bakers Saveurs. There are loads of other places to eat and most use seasonal, local produce so the menus change frequently so try out other restaurants too. My favourite pubs include the Cherub, the Castle, Bayard’s cove, the Windjammer and the Floating Bridge, which is perfect on a sunny day as they have outside seating on the waterfront. 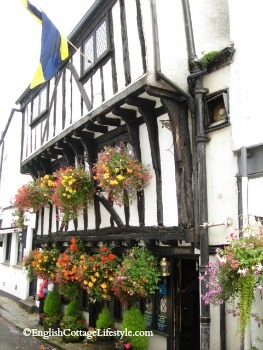 A special mention must go to the Cherub Pub which is one of the oldest buildings in Devon and worth visiting. The timber frame building is 700 years old and was once owned by a wealthy wool merchant and would have once been on the waterfront. See photo below. Dittisham…Take the small Dittisham Ferry (on the embankment) to this enchanting village for a spot of lunch or a pint. Have a walk around the village to go cottage spotting. Remember to get a return ticket for the ferry, they fill up quickly on a sunny day. Look out for the beautiful gardeners cottage on the Greenway estate its right across the river from Dittisham.See above photo. Blackawton…This lovely village is the setting of the World famous “Wormcharming” Festival in May. People come from as far away as New Zealand to try to charm the worms to the surface. 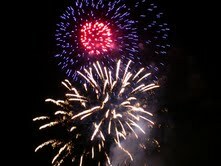 It’s one of those eccentric festivals that only England could host and it’s well worth a visit. Totnes…A more alternative town and great for people who love yoga, organics and healthy lifestyles. Totnes is very eco friendly and green it even has its own currency! They also have great restaurants I personally love The Steam Packet Inn on the riverfront. Steam Train…Possibly one of the most beautiful steam train journeys in England. The Kingswear to Paignton track runs through some idylic river and coastal scenery. For a tiny upgrade sit in the observation coach of the mighty Hercules to get the full experience. Highly recommended, the steam train runs from Easter to October. South West Coast Path...Beautiful coastal scenery and an invigorating walk. Boat Trips... If it’s a warm day take a cruise along the river Dart, there are several to choose from, you can go from the mouth of the dart to Totnes. Agatha Christie (Novelist) once described her home “Greenway” on the River Dart as “the most beautiful place in the world” it is now owned by The National Trust and open to the Public. If you’re an Agatha Christie fan try to visit Dartmouth in September for the Murder Mystery Week where there is plenty to keep amateur sleuths content you can even take a Murder Mystery dinner train or cruise along the river Dart. There are several B&B’s and Inns to stay in around town but the biggest problem here might be parking. If you want to stay in the centre but don’t want the hassle of parking, book a room at the Castle, you just drive up and give them the keys; they have valet parking. “By The Dart“…Grab an issue! ...It’s free and full of great information and is obviously passionate about The Dart and local life here. The magazine lists restaurants and business in the area plus local events. Hunt down a copy the minute you arrive! 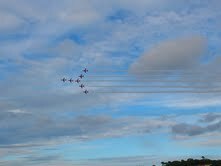 The photo below was taken with a little help from the Red Arrows during the Regatta.